Well, the ninja party was a grand success. We had a huge turnout of both children and adults, the weather was perfect, and laughter could be heard in every corner of the house and yard throughout the entire event…just as it should be! I love throwing parties of any kind, but I especially love throwing the boys parties, which are planned around a theme of their choice. 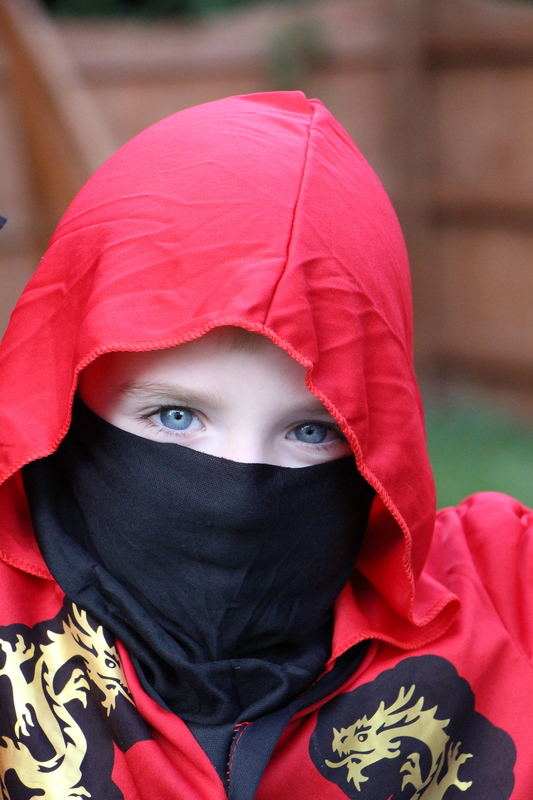 This ninja theme sort of took on a life of its own and we all had a lot of fun with it. 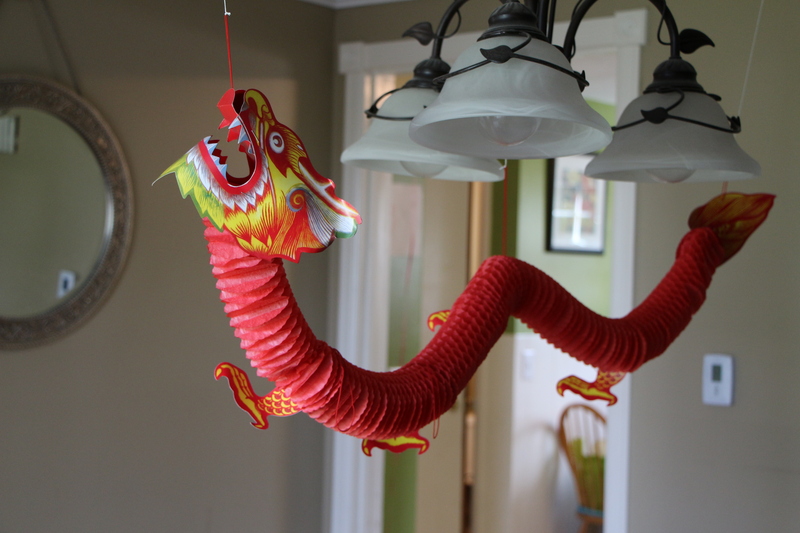 We gave the party an Asian feel with a few Chinese New Year decorations I picked up online (shhhh…don’t tell anyone they weren’t authentic ninja decorations) and a whole bunch of red, black, and gold balloons. Little accents of tiny ninjas, dragons, and Asian fans were scattered about. 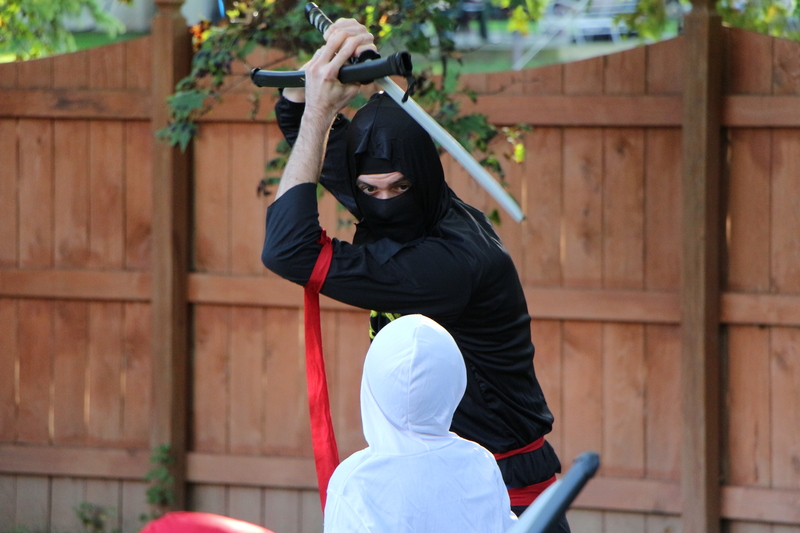 The boys dressed as ninjas and my gracious brother-in-law agreed to make a surprise appearance in full ninja attire. A bit of quick thinking at the radio had us listening to Kung Fu Fighting, as the ‘ninja’ evoked mixed feelings of terror and elation from the birthday boy and our young guests, while the adults giggled on the sidelines. 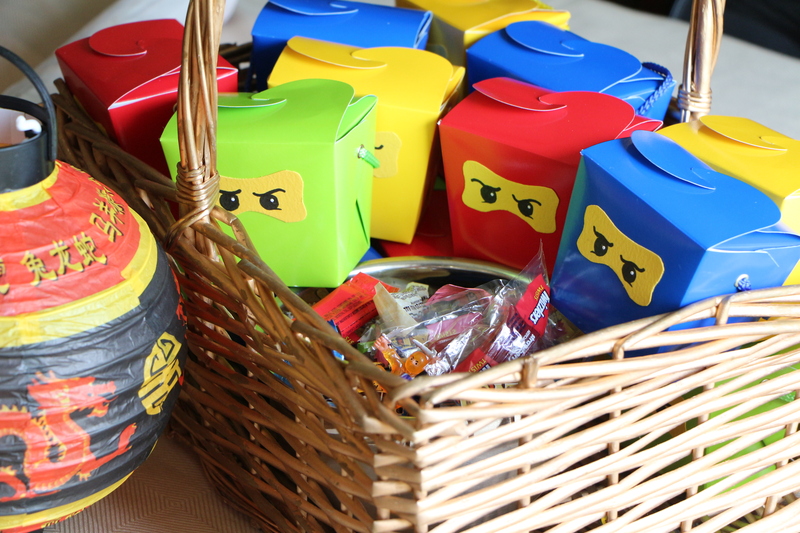 For our ninja themed party, I served a crowd-pleasing selection of Asian dishes. 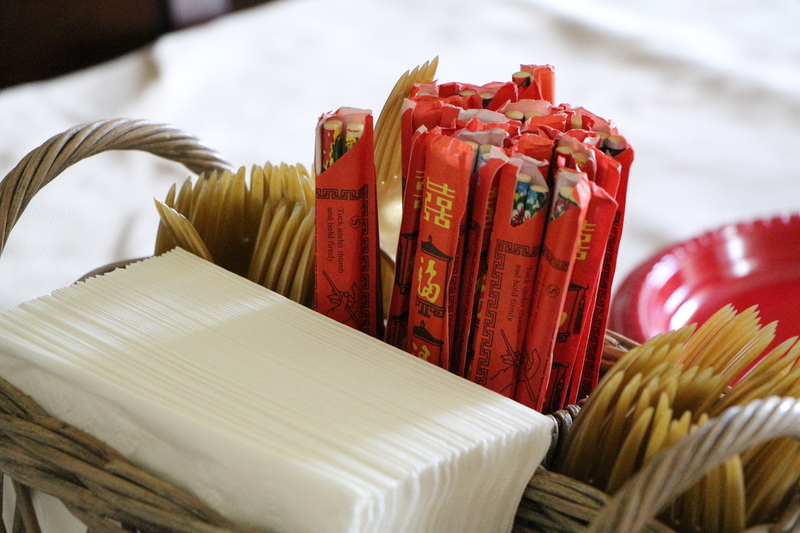 Though ninjas may be most closely associated with Japan, I planned the party buffet around a more familiar Chinese-takeout menu, which I was certain would be enjoyed by both the adults and children at our event. I made the sweet and sticky orange chicken, which I shared with you in a previous post, along with a mountain of homemade pork egg rolls (and a few veggie ones for our vegetarian guests) and a big batch of super simple vegetable lo mein. 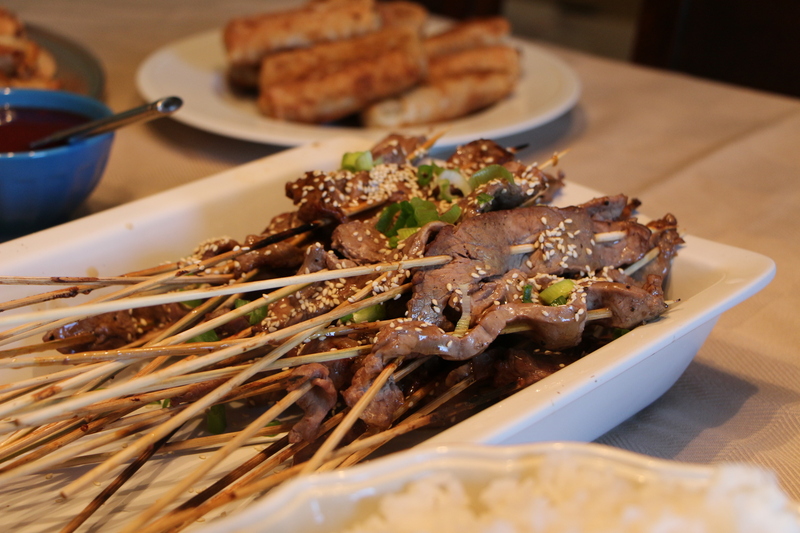 Grilled teriyaki beef skewers, sprinkled with toasted sesame seeds and jasmine rice completed the feast. I’m sharing the ‘recipes’ for both the lo mein and egg rolls below, though I should note that the batch I made was quadruple of what I’m sharing below and in the flurry of party-prep, I didn’t take exact measurements or record times as I cooked. Use the recipes as a guide, but as always, taste as you go. It’ll be ‘right’ when it tastes good to you. And be creative with the ingredient lists. 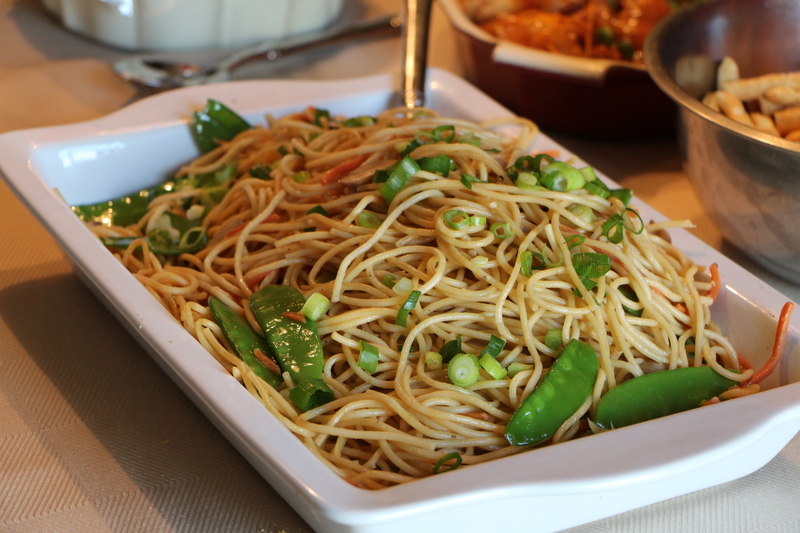 You can substitute any sort of veggies in the lo mein and add meat or seafood, if you desire. Julienne is a type of culinary knife cut, wherein the resulting pieces are long and thin, roughly the size and shape of a matchstick. 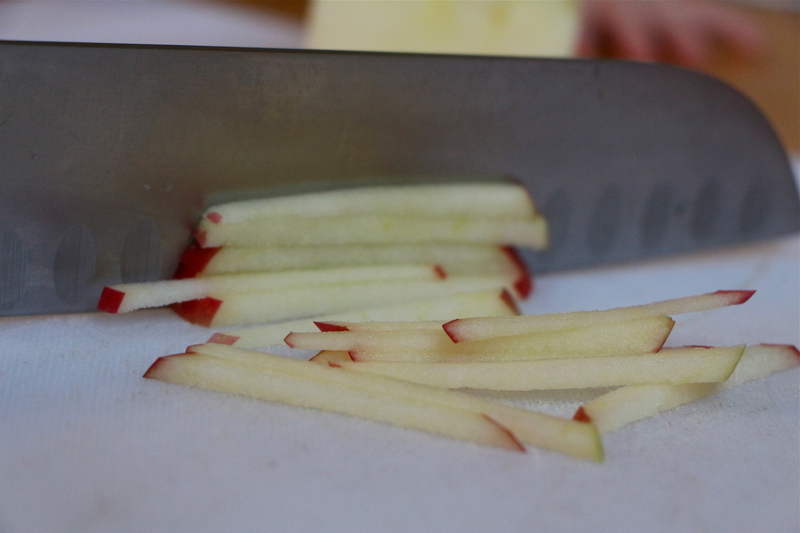 A julienne cut is often used to make shoestring potatoes or can be used to cut a variety of veggies for sushi, soups, or garnish. A julienne cut appears most pleasing when the pieces are a uniform size, shape, and length. To achieve a nice, even julienne, start by squaring your fruit or vegetable. To do this, cut off the rounded portion of one side. 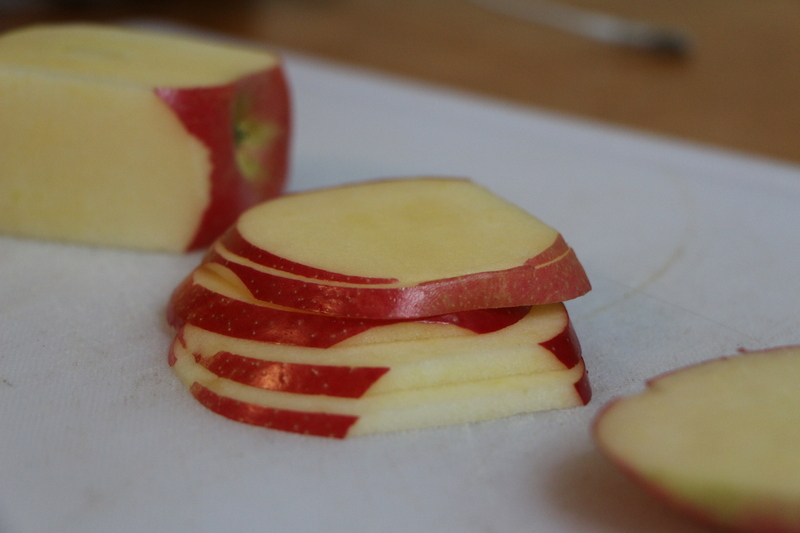 Lay the flat side down onto the cutting board, then slice off the rounded part of each side. Turn the fruit or vegetable to cut off the remaining rounded side. 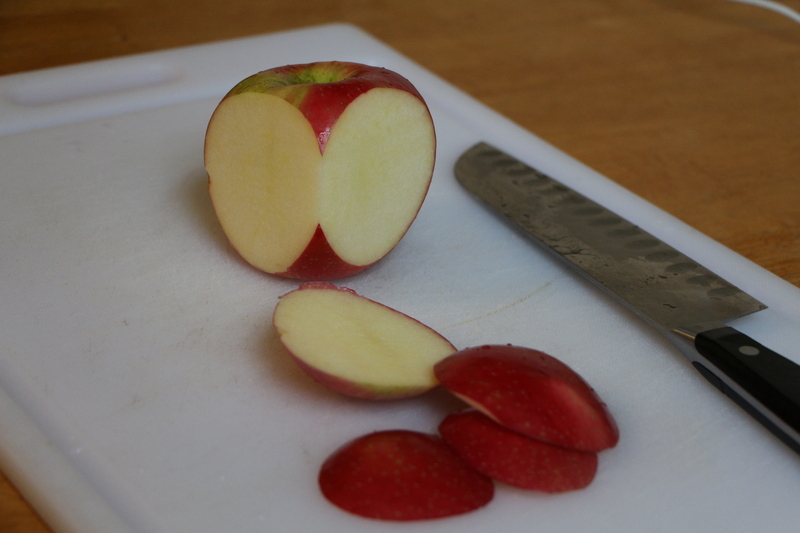 Then, thinly slice the fruit or vegetable, to about 1/8″ thickness. Finally, stack the slices and carefully cut into matchsticks, about 1/8″ wide. *If you were to cut the matchsticks into teeny tiny 1/8″ cubes, you would have a cut known as brunoise, pronounced broon-wah. Heat sesame oil in a large pan over medium heat. Add the garlic, ginger, and veggies. Cook for about 10 minutes, until tender, stirring frequently. Add the cooked spaghetti, soy sauce, and fish sauce. Toss to combine. Taste and adjust seasoning with salt, pepper and/or additional soy or fish sauce, as desired. Garnish with additional sliced green onions, if desired. To prepare the filling: Heat about a tablespoon of sesame or vegetable oil in a large pan. Add about 1/4 pound bulk pork sausage. Cook for several minutes, using a spoon to break it into small pieces as it cooks. Add about 4 cups cups of cole slaw or Asian slaw mix (very thinly sliced cabbage, julienned carrots, celery). Cook for several minutes, stirring frequently until the cabbage is wilted and tender. Drizzle about 1-2 tablespoons soy sauce over the mixture. Season with salt and pepper, to taste. 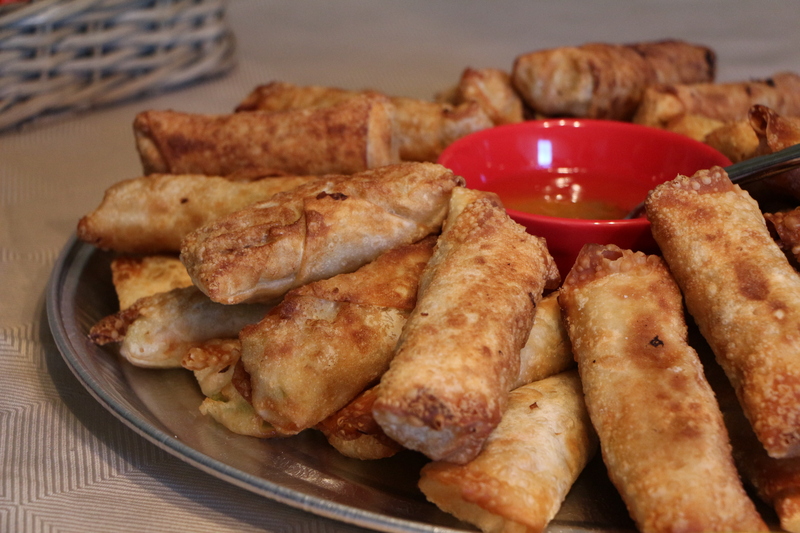 To assemble the egg rolls: Arrange an egg roll wrap with one of the points facing you. (If desired, you can layer two egg roll wraps, for a chewier egg roll.) Place a mound of the filling, about 1/3 cup, in the center of the wrap. Grab the point closest to you and wrap it up and around the filling. Then, grab each of the side points and fold them in towards the center. (Brush the points with a bit of water to help them stick.) Brush the top point with a little water, then continue rolling up towards the top point. To cook the egg rolls: Heat about 1/2″ vegetable oil over medium-high heat, to about 375 degrees. Place a few eggrolls in the hot oil. Cook for a couple minutes on each side, until hot, golden, and crispy. Drain on a paper towel. *Detailed pictures of the rolling process can be seen HERE. Posted in Appetizers, Culinary Techniques, Food, Main Course, Pork, Recipes, Side Dishes, Vegetable and tagged chinese food, comfort food, Cooking, culinary technique, easy dinner, Eating, entertaining, fall, family, Food, kids, kids parties, Recipes, vegetables. Bookmark the permalink. What a wonderful idea. It’s even better that it was a party for BOTH adults and kids. Your children are blessed (and your friend are pretty lucky too). Also, though I’m a ‘seasoned’ cook, your how-to julienne is so clear even a beginner can understand it …. even without the lovely photos. 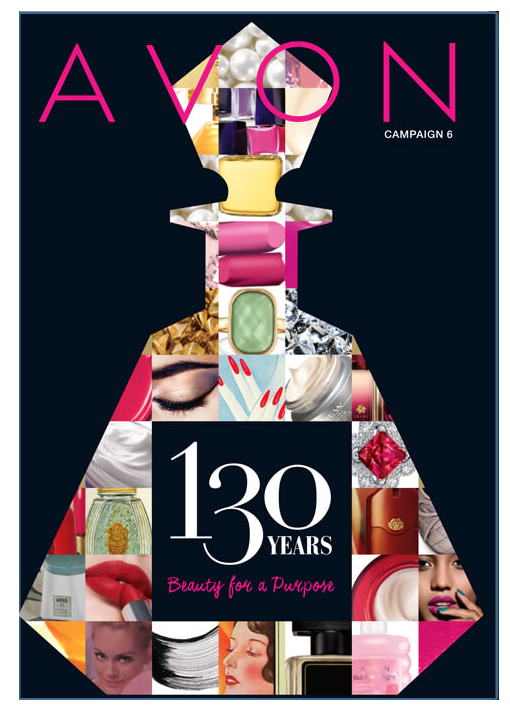 Thanks again for all your posts; I look forward to each and every one of them. Thank you so much for the nice comments! This looks lovely, thanks for sharing!